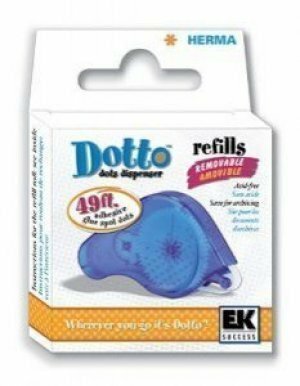 50 Pack of dotto hermafix removable refill glue - When it comes to Herma adhesive glue dispensers and refills these are on a roll! Herma adhesive glue dispensers and refills are easy to use without making a mess great for kids. Herma adhesive glue and refills are acid free archival safe and ideal for photo mounting scrapbooking paper crafts even gift wrapping! Herma adhesive glue and refills adheres securely yet repositions quickly and cleanly. Excess glue can be rubbed off. Herma adhesive glue and refills dispensers have fun bright colors make it easy to spot on busy crafting tables.